← Are Online Reviews Hurting Your Business? 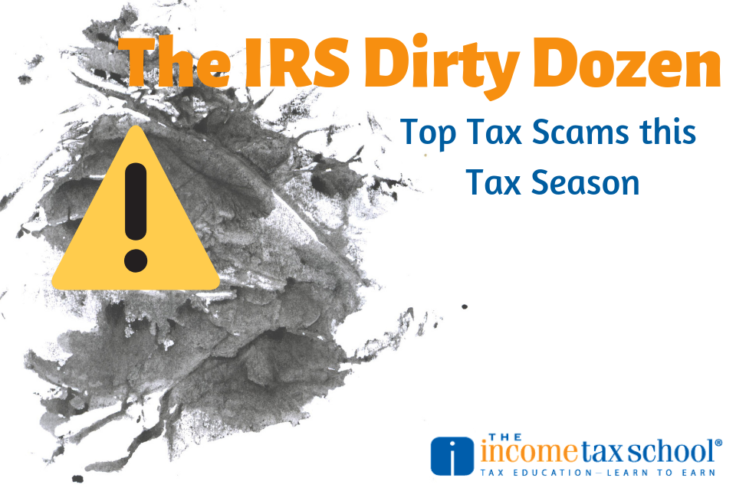 The IRS just completed its compilation of this year’s “Dirty Dozen Tax Scams” – a list they put out each year that contains the worst of the worst. Tax scams are still a big problem despite the extra precautions the IRS has implemented within the last couple of years. While it has improved, there are always new scams and tricks that affect thousands of taxpayers each year. Have you been warning your clients? Here’s a look at the Top Tax Scams this Tax Season. Before we dive into this year’s dirty dozen, there’s a new scam going on we want to point out. This is a fresh twist on an old trick where fraudsters call taxpayers and impersonate the IRS. In this scam, they take on a new role: that of the Taxpayer Advocate Service. The scammer will call from a number that seems like a robocall from the Taxpayer Advocate Service. The message will instruct the taxpayer to call back. When they do, the person on the end of the line is there to get personal information out of them in order to steal their identity. Same old scam. New trick. The most prolific of all of the scams are geared towards separating taxpayers from their personal information. Phishing scams are sent via email or social media. They usually urge taxpayers to click on a link and log into their accounts with the threat that an important action needs to be taken. The link takes them to a dummy website where the fraudster collects usernames, passwords, and other information. Phone scams are phone calls where the criminal is impersonating the IRS, the Taxpayer Advocate Service, or another agency. They work to either get a payment or personal information out of you – usually by threatening you with jail time or large fines. Identity Theft happens all year long. Your identity can be stolen in a number of ways (phishing, hacking, etc.). Criminals can steal your identity and claim your tax refund or can steal your credit card and bank account information and take your money that way. It’s unfortunate but there are tax preparers out there with criminal intent, which is precisely why there is an IRS Directory of Federal Tax Return Preparers with Credentials and Select Qualifications. Return Preparer Fraud is where the tax preparer operates during tax season to scam clients, perpetuate refund fraud, steal their identity or other scams that hurt taxpayers. Inflated Refund Claims are a scam in which the preparer promises huge tax refunds to potential clients, takes in as many clients as possible with their promise, and then illegally charges taxpayers a percentage of the refund. Falsifying Income to Claim Credits is another way a shady preparer can work their way to a bigger refund for a client. They convince the client to invent income so that they “qualify” for tax credits, such as the Earned Income Tax Credit. Falsely Padding Deductions on Returns is a common one. Overstating deductions or expenses on tax returns in order to pay less than what you owe or receive larger refunds is a crime. It’s so sad that there are people out there who would pretend to be a charitable organization only to steal people’s money. It happens all the time though, and taxpayers should be warned about it. IR-2019-39 has tips on how to spot a fake charity. This, of course, is not an exhaustive list. But these are the most prevalent scams out there. It’s important that both you, and your clients remain vigilant during the tax season so that you don’t become a victim.